SOTD : Saturday 18th August - Friday 24th August 2018. Prep: Warm rinse, BBS Face Wash then Proraso Pre Shave Cream Eucalyptus and Menthol. Post: Cold rinse, Thayers Witch Hazel with Cucumber then Nivea 2 Phase followed by Proraso After Shave Balm Eucalyptus and Menthol then EAD Divulge EdT. 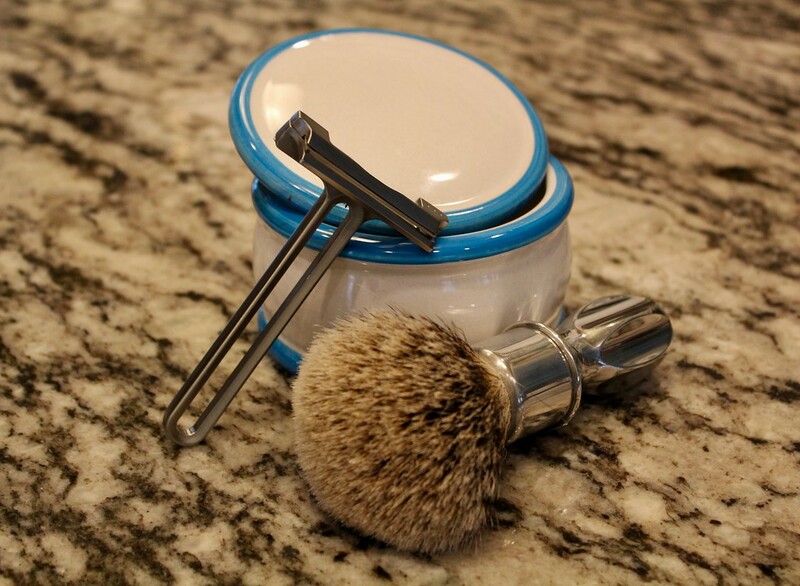 A soothing menthol shave today to relax into Saturday night. A bit of extra attention needed around the neck with some more buffing than usual, but a good finish in the end. Time for a wee half. Have a great Saturday night everyone. The Wolfman, like its open comb sibling, gave me an effortless BBS shave. The hefty handle makes it heavier than I like: with a blade loaded, it is 118g total (the handle alone being 90g). I think I'll like it better paired with one of my titanium handles. scent - Creed Tabarome parfum. Great - taking off a four day beard - very enjoyable. I think I have a lathering problem with the Kent soap - aka stealth MWF - not in the commonly reported sense - it produces too much lather for me. You only have to point the Semogue at it and it starts spewing lather everywhere - I keep my cake of it (that description is for you K. - @Boru62 - not a puck in sight mate! ha ha,) in a stainless steel tin - the lather erupts out the tin like the experiment of a mad professor - all down your arm - the brush disappears into it. Initially too foamy and aerated to be useful - but this sorts its self out fairly quickly - problem is that by that time - the den closely resembles an Ibiza nightclub - just add some banging techno - foam party ahoy! I think I may try a drier brush - to help with this - great fun - but messy as it is. So talking of lather - I'd thought to try the technique I had seen reported here - of - when you are finished your initial shave - but before the post - of squeezing out the remaining lather from the knot and applying it to your face - while you do the initial den clean up - wash your brush out, dry the razor - wipe down the sink basin. Then wash it off before you go for the witch hazel. Does it work? - I don't know. I tried doing this for the last two shaves - they were great shaves - but they may have been great anyway - I'm experienced enough - to know what products are likely to work for me - and how to shave my face. 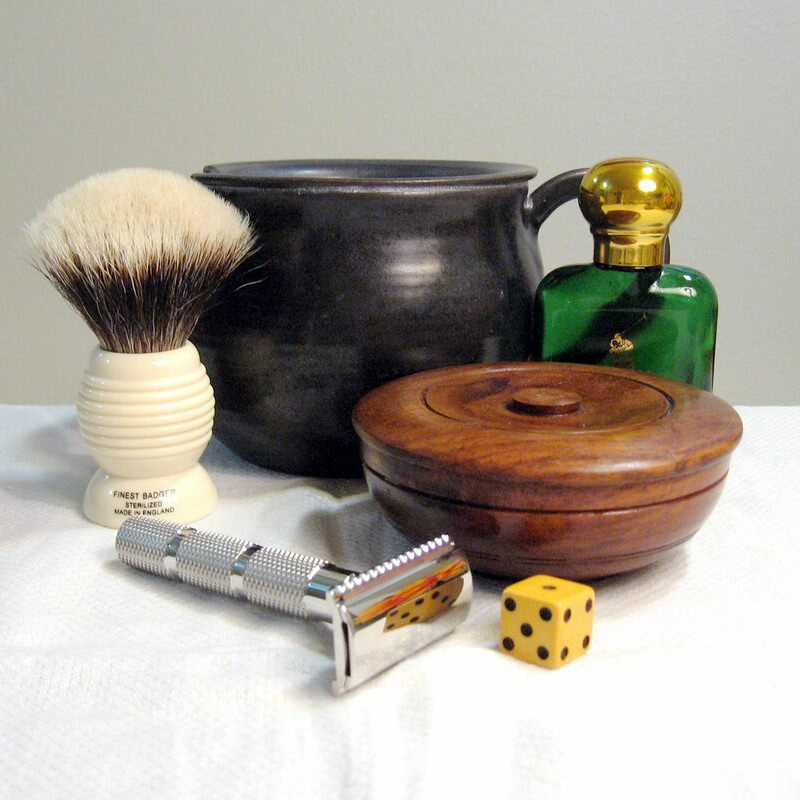 That being said - every day is a school day for wet shavers - what I do know - is that it doesn't do any harm. Some sort of objective test might be the answer. I like the aspect of not wasting products - like - I'm going to run out? I'm going to be approaching Methuselah age to finish what I already own - my skin has been feeling fantastic after the last couple of shaves - but that might have been the case anyway? Try this yourself - see what you think. I need to go - I have just inadvertently rubbed wasabi into my eye - I had sushi for dinner - and hadn't washed my hands - I feel like a liberal demonstrator at an anti-Trump demo - very much the definition of a first world problem? 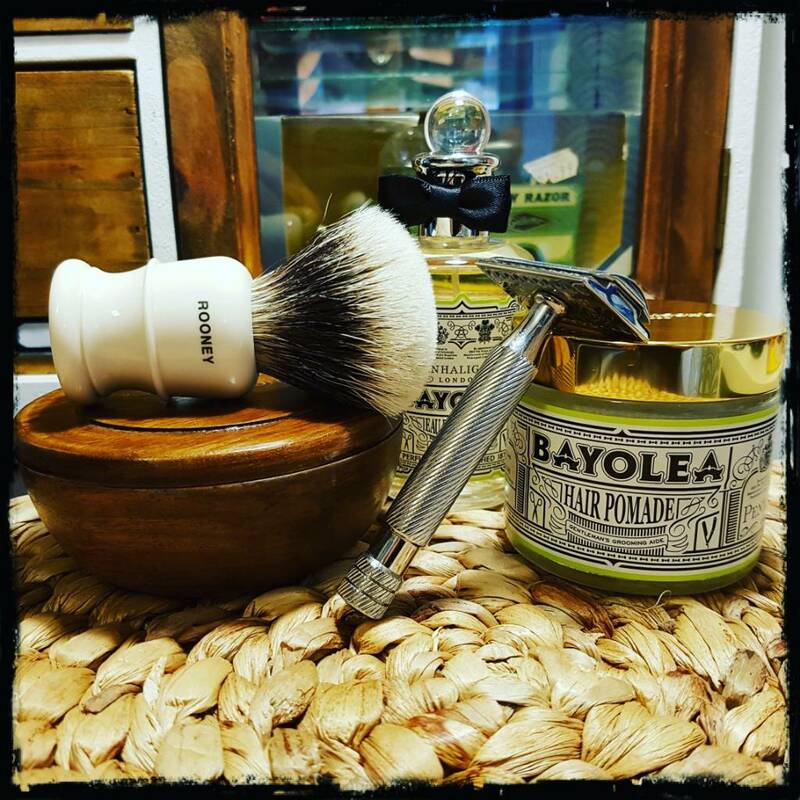 Ha ha - yours all - enjoy your shaves - I.
SOTD : 19th August 2018. Prep: Warm shower:/ L'OREAL~ Hydra Sensitive Birch Sap Shower Gel. warm wet flannel to my face. Brush: Omega 48 Pro . Cream : Arko ~ Sensitive. Warm wet flannel/ cold wet flannel to rinse my face. Cold Water Face Rinse./Homemade Lemon Lime,+Peppermint Oil & Menthol Crystals Witch Hazel Mixture./Aloe Vera Gel. I've only re-introduced myself to my Arko Creams, the Sensitive is wonderful, with a light lavender fragrance which last throughout the shave & leaves a excellent post shave feeling to the face. Second shave with the gillette sharpedge still feeling super smooth cutting through my stubble effortlessly ,pairing together with the Indian made Pearl razor superbly. Finishing the shave off with a generous splash of Herbs of Bulgaria ~ Lavender A/S, which also has soothing menthol kick to it...Superb stuff!. Enjoy your sunday, ladies & gentlemen. Excellent I, keep up the good work. I have a suggestion: use the squeezed soap on one half of your face and see if there's any difference. Morning shave today as we're travelling to a part near the River Ouse in Bedford to meet up with family. Only around 36 hours of growth to remove instead of my usual two days. The Lavender soap didn't take much encouraging to yield it's creamy aroma rich lather and the scent was prominent throughout the shave. The Astra blade showed no signs of dulling on it's third use, but I won't push it any further. For no real reason I haven't used witch hazel post shave for a while, I've replaced by using balms. This seems to be working for now at least. Finishing with a few squirts of BoIs Du Portugal and I smell great ! 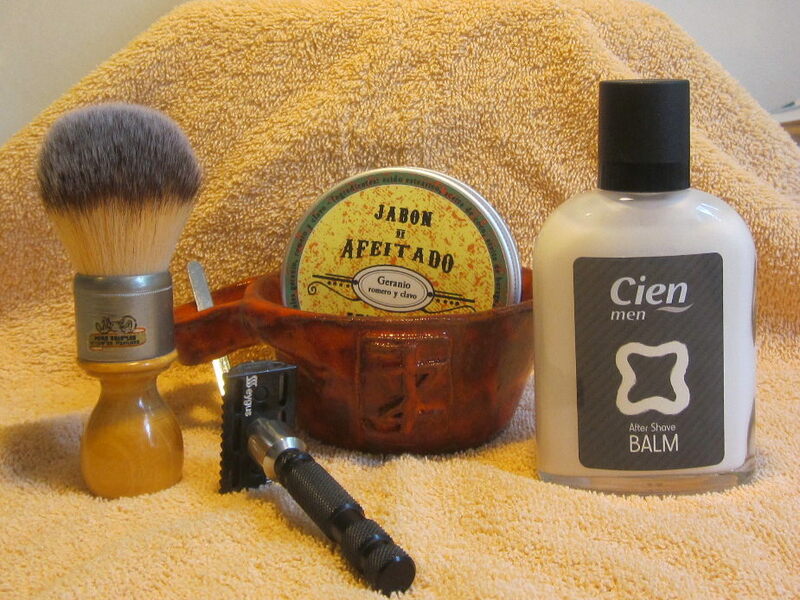 To paraphrase Bono, Sunday Cloudy Sunday, all the same a very nice shave ensued. Be careful with that excess lather Iain. You don’t want to have your cake and eat it. A super smooth shave with the Gibbs. Have a good Sunday chaps. My final shave with the G1 before it gets sent up- country for testing and evaluation. The shave using my Penhaligons Sartotrial products was wonderful as was the shave with the G1, a little bit of blade feel but not too much and a close and clean finnish. The perfect way to start a Sunday. Wishing you all a splendid Sunday......P.
Vintage brush / Maggard synth. Jabones by Luna “Geranio romero y clavo”. Feather New Hi Stainless (5). Great summer sunday shave and perfect matching fragrance. Good day to all of you gentlemans!